The new Husqvarna 701 Supermoto comes with a new 690 engine from the 2016 model of KTM’s Duke series. Unlike the race-ready KTMs, the new Husqvarna is meant to be more enjoyable, comfortable, and accessible for all types of riders. Will the new Husqvarna live up to our expectations? Let’s take a closer look! The 2017 Husqvarna 701 Supermoto comes with the same Steel trellis frame as last year’s model. The overall weight of the bike without fuel is 145 kg. The 2017 model only has one colour option, white. The front suspension is 48 mm WP-USD while the rear is WP-Monoshock with pro-lever linkage. The seat height of the new bike is 890 mm and has a ground clearance of 270 mm. Just like the previous model, the new one is stable and balanced. The capacity of the tank is same as last year’s model, that is, 13 litres. The front brakes are four-piston Brembo, radial callipers with a brake disc of 320 mm. The rear brakes are single-piston Brembo, floating callipers with 240 mm brake disc. The bike comes with an up-to-date Bosch 9.1 MP ABS, which the rider can turn off. The control and the stopping power of 701 Supermoto are incredible, giving the rider total confidence and maximum safety. 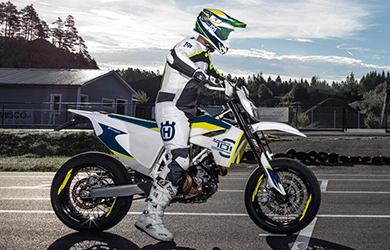 The Husqvarna 701 Supermoto is primarily white, with yellow and blue streaks all over the motorcycle. The graphics have also been updated, giving the motorcycle a fresh look. The steering head angle of the motorcycle is 63°. 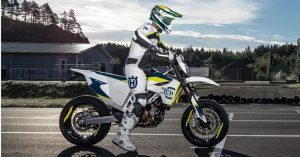 The engine for the Husqvarna 701 Supermoto is almost the same as the one on the 2016 KTM Duke. The revised 692.7 cc engine comes with a shorter stroke and longer bore. There is a new crankshaft, plain bearing, piston, and connecting rod. Unlike the older model, the new version has 9500 rpm as the second balancer shaft reduces vibrations. The engine produces 74 bhp at 8,000 rpm and a torque of 52.3 lb-ft at 6,750 rpm. Even though the motorcycle has a single cylinder engine, it feels like a twin-cylinder engine because of the second balancer shaft. The Husqvarna 701 Supermoto has a six-speed gearbox and two oil pumps for pressure lubrication. The engine is liquid-cooled. The hydraulically operated clutch for the new 701 Supermoto is Adler Power Torque Clutch (APTC) slipper clutch. The Keihin Engine Management System (EMS) with RBW manages the revised 692.7 cc engine. According to the data given by engine sensors, the EMS optimises the throttle valve for a perfect throttle response and power delivery. Overall, the Husqvarna 701 Supermoto is a brilliant motorcycle for all types of riding, ranging from daily commutes to off-road adventures. The ride-by-wire throttle combined with the updated engine makes the motorcycle exciting to ride. The motorcycle is quick in the corners, while the ride is stable and balanced. The stopping power of the motorcycle equipped with Bosch 9.1 MP ABS, front four-piston and rear single-piston brakes is exceptional. The base price of the Husqvarna 701 Supermoto is £8,299.00.